Cambodian rice variety Phka Rumduol, often called Phka Malis or Cambodia Jasmine Rice by rice millers and traders, was chosen as the “World’s Best Rice” during the Rice Traders World Rice Conference held in Hong Kong in November 2013. Rice samples from several countries, including Cambodia, India, Myanmar, Thailand, and the United States, were evaluated in several rounds based on raw (chalkiness, head rice, shape, and size) and cooked qualities (gloss, color, stickiness, flavor and texture). Phka Rumduol was developed through support from the Cambodia-IRRI-Australia Project (1988-2001) and was officially released as a variety by the Cambodian Agricultural Research and Development Institute (CARDI) in 1999, the same year CARDI was founded. With continuous efforts to disseminate the variety since then, Phka Rumduol was accepted as one of the ten rice varieties promoted by the Royal Government of Cambodia in late 2010. It is now widely grown in Cambodia. Phka Rumduol typically yields 3.5–5 tons per hectare under rainfed lowland conditions. It has a long slender grain and a nice jasmine-type aroma, is not chalky, and has low amylose content (13.8% which makes it quite sticky when cooked. The milled rice is translucent and the cooked one soft-textured, unbroken, and flavorful. Dr. Baharsjah received the Umali award on 16 January during a ceremony held in Makati, Philippines, hosted by the Dioscoro Luna Umali Foundation, the Southeast Asian Regional Center for Graduate Study and Research in Agriculture, and the Philippines’ National Academy of Science and Technology. H.E. Ade Petranto, charge d’affaires at the Indonesian Embassy, described Dr. Baharsjah’s achievements as a strong foundation for his country’s efforts toward a sustainable and secure domestic rice supply.“Considering the size of its population, Indonesia was able to maintain and sustain its rice stocks with very marginal importation from neighboring countries,” he said. Dr. Baharsjah was minister of agriculture in Indonesia (1993-98) and was the first Indonesian elected as chair of the IRRI BOT (1996) and as independent chair of the Food and Agriculture Organization (1997). He earned his masteral and doctoral degrees in agricultural economics at the University of Kentucky in Lexington (1965) and at the North Carolina State University in Raleigh (1974). Fangming Xie, hybrid rice breeder at IRRI, is one of 15 chosen to receive the Anhui Friendship Award for his contributions to the social and economic development of Anhui Province in China. Dr. Xie, the only one among the awardees who is from the agriculture sector, helped the Anhui Academy of Agricultural Science (AAAS) develop drought-tolerant rice varieties suited for a rice-wheat cropping system. One of the varieties, Green Drought I, does not require much water to cultivate nor extensive land preparation to embank water. IRRI’s work in the Cauvery Delta and other parts of India, especially those conducted under the Cereal Systems Initiative for South Asia (CSISA) and the Stress-Tolerant Rice for Africa and South Asia (STRASA) projects, were the focus of an exhibit featured in an agriculture fair held in Aduthurai, Tamil Nadu. The Cauvery Delta is Tamil Nadu’s rice bowl, but the area suffers from regular shortages of irrigation water and of farm labor. Recently, poorly drained areas of the delta that have heavy clay soil have also started to sustain damage from flash floods that follow heavy monsoon downpour. Four tons of seeds of high-yielding rice varieties were donated by IRRI on Tuesday, 14 January 2014, for farmer survivors of Typhoon Haiyan (Yolanda). The seeds were received by Ariel Palo, representing the Department of Agriculture (DA), on behalf of rice farmers in areas in the Visayas region that suffered the most damage from the supertyphoon. For his work in helping his country, become rice self-sufficient, Indonesian Sjarifudin Baharsjah has been given the 2013 Dioscoro L. Umali Award in agricultural development. Awarding rites will be held on 16 January 2014 at the New World Hotel in Makati City, Philippines. Dr. Baharsjah is a former member of the boards of trustees of IRRI and the International Food Policy Research Institute and was once chair of IRRI’s. From 1997 to 2001, he was independent chair of the Food and Agriculture Organization of the United Nations (FAO) Council. 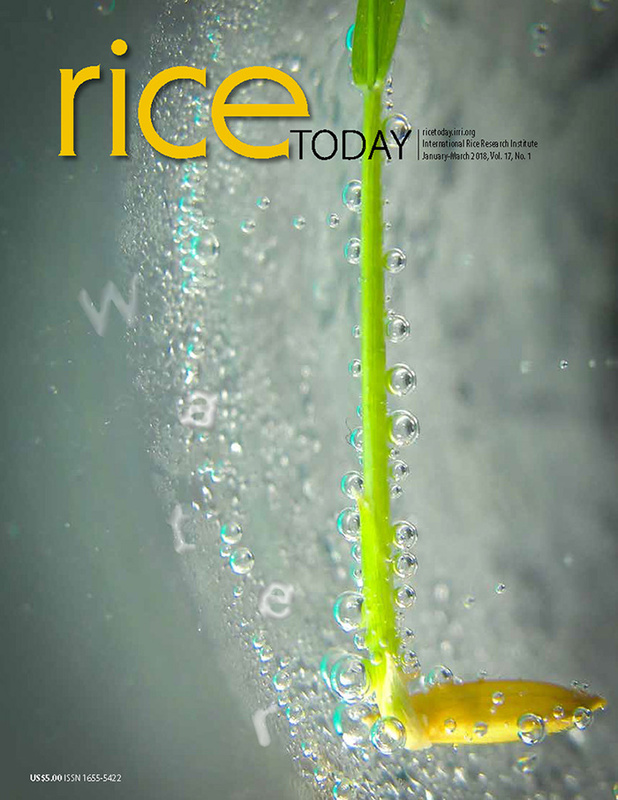 Rice, the staple food of Asians, was the starting point of a symposium attended by chefs, food writers, academicians, and entrepreneurs in Hong Kong who wanted to take a sociocultural look at food as a medium for connecting cultures in Asia. The symposium, In a Grain of Rice: Food & Culture for South & Southeast Asia, was held on Sunday, 12 January 2014 at the Asia Society Hong Kong (ASHK) Center and featured IRRI’s research work on improving the eating quality of rice. The event is connected with the No Country: Contemporary Art for South and Southeast Asia touring exhibit of the Guggenheim MAP Global Art Initiative, which features the work of 13 artists from Bangladesh, Cambodia, India, Indonesia, Malaysia, Myanmar, Pakistan, the Philippines, Singapore, Thailand, and Vietnam. Rosa Paula Cuevas, a postdoctoral fellow at IRRI’s Grain Quality and Nutrition Center, in her presentation In the pursuit of the perfect rice variety said that South and Southeast Asia account for more than half of the International Rice Genebank’s collection of 120,000 rice types, which include heirloom rice varieties. By making use of the rice diversity stored in its genebank, IRRI breeds improved varieties that not only yield more grain or are more resilient against climate change but also have good taste and texture. About a hundred people composed of ASHK members, art and culture enthusiasts, and members of the academe, media, nonprofit and private sectors, and the general public took part in the cooking demonstrations by various chefs and in IRRI’s rice-tasting activity. Participants of the rice-tasting activity were asked to sample four rice types (brown, black, jasmine, and basmati) and vote for their favorite, considering attributes such as texture, aroma, and flavor; health benefits; and price. Black rice was the favorite among participants, getting 41% of the votes, followed by brown rice (29%), basmati (23%), and jasmine (7%). Participants surveyed after the rice-tasting activity said that most of them normally eat jasmine rice. The symposium was sponsored by the Asia Society, with which IRRI has partnered for several initiatives such as the Never an Empty Bowl Task Force report released in September 2010 and the 38th Williamsburg Conference held at IRRI’s headquarters in the Philippines in May 2010.
member of Asia Society, during the rice-tasting activity. The IRRI Climate Change group and the Regional Program Office of CCAFS (Climate Change, Agriculture and Food Security) jointly organized a hands-on training and coordination workshop on greenhouse gas (GHG) emission measurements in rice fields. The overall goal of the training was to enhance the technical skills of NARES staff thereby increasing their know-how to plan and conduct research activities on GHG mitigation in major rice growing areas of Southeast Asia. The event also aimed to develop standardized procedures that will increase precision and accuracy of GHG flux estimates for creating mitigation options for GHG emissions from rice fields. A total of 13 delegates composed of 7 women and 6 men from Hue University, Cuu Long Delta Rice Research Institute(Vietnam), Prachin Buri Rice Research Center, King Mongkut's University of Technology Thonburi (Thailand) ), Indonesian Agricultural Environment Research Institute (Indonesia) and the Philippine Rice Research Institute and the University of the Philippines-Los Banos attended the workshop. The course was also attended by two scientists from the National Institute for Agro-environmental Sciences (Japan) to ensure compatibility of their emission measurements with the techniques presented. The Japanese participants also took over individual lectures in this course. The training was conducted by Dr. Agnes Padre (who also coordinated the course), Dr. Bjoern Ole Sander, Dr. Maricar Alberto, Ryan Romasanta, and Heathcliff Racela from IRRI's Climate Change Group. Uma Shanker Singh, IRRI scientist and south asia regional coordinator of the Stress Tolerant Rice for Africa and South Asia (STRASA) project, took part in a seminar about enhancing rice productivity at Chandra Shekhar Azad University of Agriculture and Technology in India on 30 December 2013. Dr. Singh delivered a lecture on enhancing stability in rice productivity in South Asia through climate resilient rice variety. He said the project has remained momentous in increasing the production of rice both in India and South Asia. He also discussed the challenges, like flood and drought, which affect the production of rice. Dr. Singh stressed the importance of developing rice production in the country and varieties resistant to weather and climate changes. "By way of using advanced technology, the production of rice can be increased manifold which can end the existing shortage of food in the world," he said. The Young Researchers' Lunch for December hosted Robert Furbank, plant physiologist and director of the High Resolution Plant Phenomics Centre at CSIRO in Canberra, Australia. Dr. Furbank discussed a number of high-tech approaches that his group is developing and the strong collaborative research network among scientists and wheat producers in Australia. He also had a number of suggestions for employing high-throughput phenotyping techniques at IRRI. I. Zarei, C. Diaz, S.Shrestha, R. Bahuguna, M. Sattari, and M. Acoba attended the event.